Truth be told, I miss the Bastille. The current column that stands where the old fortress towered above passersby seems very bland by comparison. What a building the old Bastille must have been! But 18th century Parisians had a grimmer take than I on the fortress. It was used as a weapon and ammunition depot (the immediate cause of its storming on the 14th of July 1789) and its location was strategic: it controlled the entry to the unruly Faubourg Saint-Antoine, where riots could often become violent. 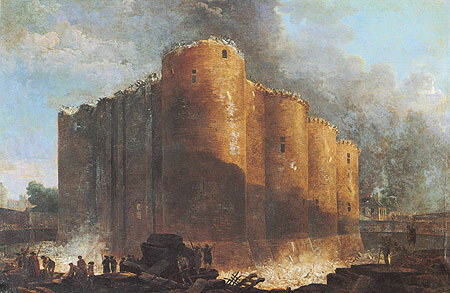 In April 1789, shortly before Bastille Day, hundreds of people rampaging in a nearby wallpaper factory to protest a proposed drop in wages had been slaughtered by the Gardes Françaises, the French Guards, the riot police of the time. The memory of this bloodbath was still fresh in the minds of Parisians a few months later. The demolition of the Bastille was decreed. I joined the crowds that hurried to visit the fortress while it was still standing. I did not approve of the violence that had followed its fall, but, as almost everyone in Paris, I rejoiced to see the place destroyed. It had been the symbol of the arbitrary detentions of the Old Regime, of the dreaded lettres de cachet. I had not forgotten that I had been threatened with one myself. I did not regret leaving Aimée at Vaucelles, for the huge round towers reeked of putrefaction. Some contained windowless cells, locked with double doors three inches thick. No air could penetrate there and the straw on the floor, thick with human wastes, had turned to manure. The worst dungeons were located below river level. Prisoners there had lived in a foot deep in water year round. Their torments were increased by the fear of drowning during the floods of the Seine every spring. I saw torture instruments and iron cages, six feet square, one containing a complete human skeleton. After that descent into hell, it felt odd to see the light of day again and to enjoy the warmth of the sum on one’s face. Outside the fortress, all was cheerful. Little temporary cafés, sheltered under striped tents, sprang up in the summer heat. The site had become a fashionable excursion in spite of the dust and noise of the demolition. I bought Aimée a game of dominos made from the old stones of the Bastille, which had been turned into all sorts of mementos. 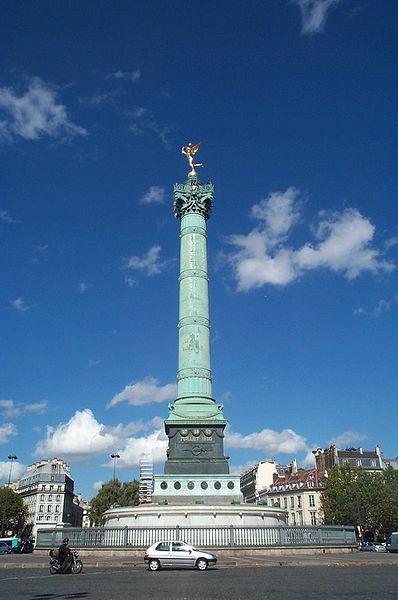 One final note: Revolution or no Revolution, the Bastille was doomed. Under Louis XVI, an extensive plan of renovation of Paris was underway, as attested by the demolition of the houses built on the bridges of the city. The Bastille was a “gothic” anachronism, incompatible with the King’s idea of a modern metropolis. Nonetheless, happy Bastille Day to all!